Williamsburg International FC are Flamhaft Cup champions in 2018 and are arguably one of the fastest rising teams in the Cosmopolitan Soccer League. In a dramatic 3-3 tie in the Jack Flamhaft Cup final at the Verrazano Sports Complex on June 3rd in regular time, the only things seperating the Doylies and opposition Brishna was the dreaded penalty shootout with Williamsburg winning 5-4. Ending the league with the State Cup and a respectable 4th place finish in the South standings in their debut season in the 2nd Division, the club enters off-season with much to look forward to next season. 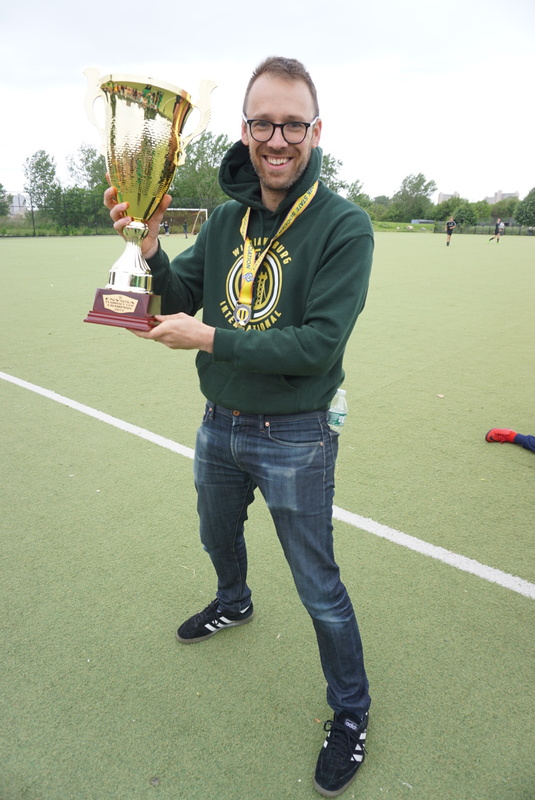 With a cup final victory still in the memory, the CSL spoke to WIFC Secretary Charles Von Rosenburg about the Cup final, their D2 league season, and the future of Williamsburg International Football Club. Q: Flamhaft Cup champions and achieved it with a dramatic penalty shoot-out against strong opposition, how is the team feeling? von Rosenburg: "We are feeling great! As it became clear that Hoboken and Polonia were going to finish on top of the D2 South, our attention shifted to the Flamhaft Cup. We had a great run, overcoming a very challenging schedule and good opposition. To win this trophy in our first year in D2 was definitely something special." Q: Brishna looked to have the upper hand multiple times during the match. A comeback is never an easy feat. How did the team overcome their mistakes to get back into the game? von Rosenburg: "Brishna came out strong early. They scored two quick goals within the first fifteen minutes. Our strikers uncharacteristically missed some chances, but Brishna was the better team in the first half. To be fair, we played both the semi-final and final without a true goalkeeper. Lucky for us, Chris Blivin, who normally plays striker, had the athleticism to come up with some big saves in key moments to keep it close. In the second half, we struck early through John Kaddo to cut the lead in half. Once we had shown that we could threaten their defense, the dynamic of the game changed. A tying goal felt inevitable and eventually came off the foot of Mark Gallagher. However, Brishna fought back and when they went up 3-2, I wasn’t sure that we could muster another goal. We were saved by Rich Clements who hit a speculative half-volley that somehow got past the Brishna goalkeeper. In the end a draw was a fair result and penalty kicks were the only way to separate the two teams." Q: What made Brishna so difficult to break down and dispel in the box? von Rosenburg: "Brishna were well organized and did a great job of calmly working the ball through the midfield. Their wingers ran up and down the field the entire match, causing us problems on the flanks and making it difficult to create opportunities going forward. A tactical shift at half time allowed us to break through on the counter and make life more difficult for their back line." Q: Did the dreaded penalty shootout lessen or only improved hopes for the victory? von Rosenburg: "Penalty kicks are a game of chance. It helps to have five cool-headed shooters on your side, but it could have gone either way. Both teams were surprisingly composed and every shot went in until the final take when we got our break and Bilvin was able to keep one out." Q: Campaigns to remember for Kaddo and Gallagher, with 18 and 19 goals respectively, not to mention the rest of the solid starting lineup and bench. How would you describe the seasons they had? von Rosenburg: "Kaddo and Gallagher score for fun. Those guys are incredible additions to our lineup and they make us a challenge for any team to defend. But, they are supported by a talented group of players. Without solid defending and service from the midfielders, we wouldn’t have the opportunities to score that have allowed them to rack up numbers like they did." Q: Any favorite moments from the season as a whole? von Rosenburg: "Obviously, lifting the Flamhaft Cup is the number one highlight of the season. Other memorable moments include our first team coming back from a 5-2 deficit to draw with Polonia NY in our opening match. And for the Reserves team, knocking an otherwise undefeated Hoboken FC Reserves team out of the Saunders Cup with a 2-0 victory in March." Q: With that much silverware in the time you’ve spent in this league, are Williamsburg a team to fear all throughout the CSL? von Rosenburg: "I don’t know that we are a team to fear. We’re all nice guys and we like to play entertaining, attacking soccer. Q: Any players you are interested in bringing to WIFC in the future, such as in your reserve side or elsewhere? von Rosenburg: "We’re always looking for talented players that want to have fun playing against great competition. We are a little more fluid between our Reserves and Firsts teams and consider it to really be one club with shared goals. We’ll certainly be adding to the lineup and mixing up the first and reserves teams for next season." Q: What will you look forward to in your next season in the Cosmopolitan Soccer League’s 2nd Division? von Rosenburg: "We look forward to measuring ourselves against solid competition in the best amateur league in America. We’ll start out by defending our cup. If the ball bounces our way, I think we have the talent to challenge for a division title." Q: What does the future hold in store for the Doylies? von Rosenburg: "Goals, goals and more goals."